≈ Comments Off on How do I Grocery Shop? If you’ve thought at all about groceries and finances, you’ve probably heard have a price book, make a list, and stick to it. I readily admit that I did check all my prices at one point in the past; now they’re mostly in my head. But, since Wegman’s moved in and its been many years since I last checked everything, next fall I need to do this again. 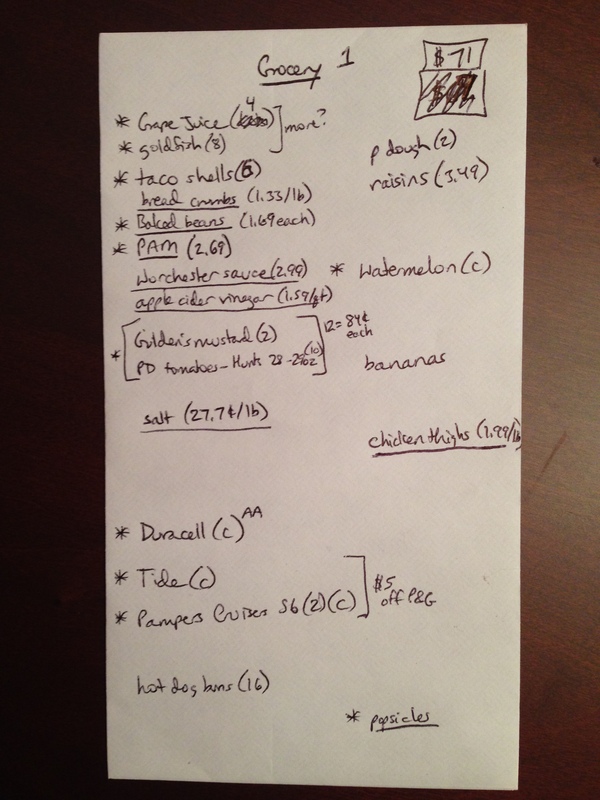 I can shop with kids in tow (and a list); I cannot make/maintain a price book. So, this week I had $5 off a $25 purchase at Wegman’s (plus $2 off Health & Beauty and $1 off produce if I spent $25). The best deal here was the kid’s toothpaste which was $2.59 or $0.59 after the coupon. I’ll include the photo of my groceries next Monday. Plus, if I spend $25 on P&G products I get an extra $5 at the register, no coupon required. 1 Tide + 1 Duracell + 2 pampers makes $25. Sum total of coupons to stay above $50 and get the gas points = $71. Normally this is easy to keep track of at Stop & Shop because Scan It allows you to scan as you go. The trick this week is that they have a bunch of stuff available for $0.84 each if you buy 12. This won’t correct until I get to the register so I’ll have to do the math in store to figure out how much above $71 I need to spend with this factored in. It’s a little messy, but my system is the same every week. It’s on an envelope where I can put my coupons. The total I need to spend is in the upper right; it gets changed as I find more relevant coupons. Stars are items on sale; parentheses indicate quantity and whether there is a coupon. An underline means I don’t need it now, but will soon (these items help keep my spending level) or they’re fun, well priced items to make the spending amount. Grape juice & goldfish are bracketed as these are items I can essentially buy an infinite supply of so I have a number I will buy, but I’ll get more to get to $71 if necessary. Mustard and tomatoes are bracketed because I need to buy a total of 12 of these items. Duracell, Tide, and Pampers are bracketed because they go together also. Finally, I have the best price elsewhere for a few items that I’m unsure of Stop & Shop’s price on so I know whether or not to buy them. A few cents high and I probably will because of the value of making it to $71; but $1 high (which may well happen) and I’ll leave them for another store/another day. 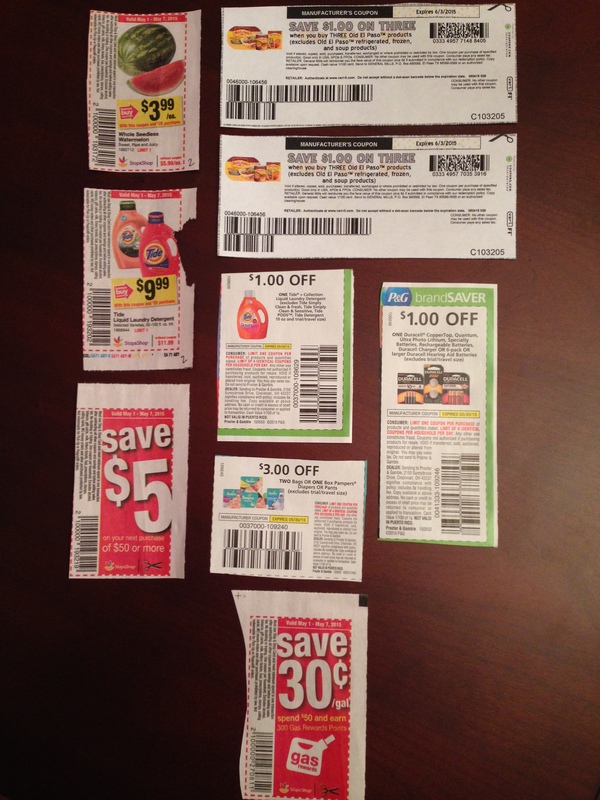 In summary, I do use coupons if they come my way, but I don’t spend large amounts of time hunting for them. And, I do shop with a list, but it has some flexibility. I’ll let you know Monday what I actually bought.